DEFORM is a specialized engineering software package designed for the analysis of metal forming processes, thermal and mechanical processing. DEFORM allows you to check, work out and optimize processes directly at the computer, rather than during production experiments. trial and error. Due to this, the terms of production are significantly reduced, its quality increases and the cost price decreases. The DEFORM software package has a flexible modular structure that allows the user to select and purchase the optimal set of modules for the nomenclature of tasks to be solved. DEFORM - 3D is a module designed for modeling three-dimensional metal forming processes. DEFORM - 2D - a module designed to simulate two-dimensional metal forming processes (axisymmetric and planar tasks). DEFORM - F3 is a module designed for modeling three-dimensional metal forming processes. It is a "lightweight" version of DEFORM - 3D. DEFORM - F2 is a module intended for modeling two-dimensional metal forming processes (axisymmetric and plane tasks), a "lightweight" version of DEFORM - 2D. DEFORM HT3 and DEFORM HT2 are modules designed to simulate, respectively, three-dimensional and two-dimensional (axisymmetric and planar tasks) heat treatment processes. Ring Rolling (3D) - a module for simulating the processes of ring rolling. It can work as a separate module as well as an application to the DEFORM - 3D module. The algorithms of the solution are optimized for the process of rolling rings. The generator of grids of the module builds a grid of 8-node hexahedra and, if necessary, can automatically rearrange it. Provides complete information on the progress of the rolling process with the possibility of its visualization. The results of solving using the Ring Rolling 3D module for several tasks in comparison with experimental data can be found here. Cogging (3D) is an application to the DEFORM - 3D module for modeling hammer pulling processes. The module includes a set of standard geometries of blanks and a manipulator for pulling. The process parameters are the number of heatings of the workpiece, the order of submission and tilting, the size of the striker, the time between the impact and the submission. Previewing the simulated operation helps prevent errors. Provides complete information on the progress of the rolling process with the ability to visualize it. Shape Rolling (3D) - an application to the DEFORM - 3D module - simulation of rolling processes to prevent the formation of wrinkles in the material, stretch marks, etc. Such processes as the form factor, the amount of movement and the speed of the rolls can be optimized. A simple, step-by-step interface of the module, a library of standard blanks and rolls make it easy to enter the initial data for the simulation. Inverse Property Extraction (2D) - application to the DEFORM - 2D module, determination of the heat transfer coefficient at the boundary of the workpiece. A simple, step-by-step interface of the module helps the user from the input of the source data to the final result. 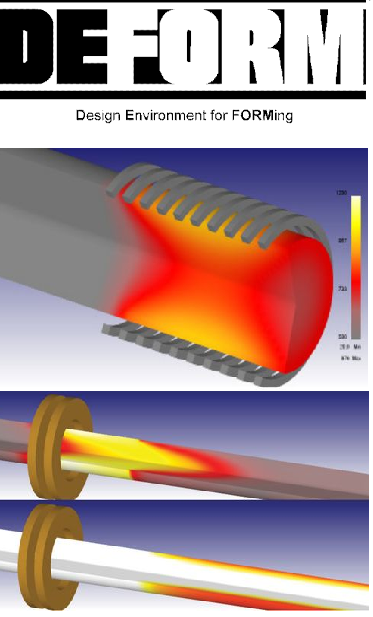 Microstructure (2D or 3D) are applications to the DEFORM - 3D and DEFORM - 2D modules, respectively, for modeling three-dimensional heat treatment processes. Functionally correspond to the modules DEFORM HT3 and DEFORM HT2, but, in addition, allow you to simulate the microstructural transformations in the workpiece during its deformation. Machining (2D or 3D) - applications to the DEFORM - 3D and DEFORM - 2D modules, respectively, for modeling machining processes. Simulation Queue is an option that allows you to automatically perform batch processing of multiple tasks. To work with additional modules, you must have DEFORM - 3D or DEFORM - 2D, respectively. - 2 GB on a hard disk + volume for projects.